Southern plantations, outdoor garden ceremonies and oceanfront Receptions are what WEDDINGS in the SOUTH are made of. After personally getting to know each couple a plan is strategically designed to execute your most imaginable wedding day. If you have a reason to celebrate, we have a reason to plan a party! Celebratory and private events in the Myrtle Beach, SC and Grand Strand areas are some of our most wanted events. By having a creative event planner you are guaranteed to enjoy your occasion while it is managed flawlessly. EBS specializes in designing full service events that uniquely showcase your company's mission and brand. Whether it's a company retreat, quarterly award ceremony or fashion show our experience and resources are what you are looking for to wow your clients. Born in Myrtle Beach - Raised in Kentucky - I consider myself a one of a kind! I am a lover of tacos, good bourbon & colorful fall days! I have the most amazing boyfriend and a very large, crazy family that I wouldn't trade for the world. St. Patrick's Day is my favorite holiday and I love to dance!! Their venue is full of elegance and class and that was the theme throughout the entire wedding. By taking elements from the 20’s era such as crystals and gold, and Art Deco style shapes and fonts and combining it with modern, romantic candlelight and greenery took Lauren & Rapp’s wedding day to beautiful luxury. Hannah & Greg are one-of-a-kind, complete opposite individuals yet fit together so perfectly. The geometric theme was ideal for Hannah's bubbly, playful personality. 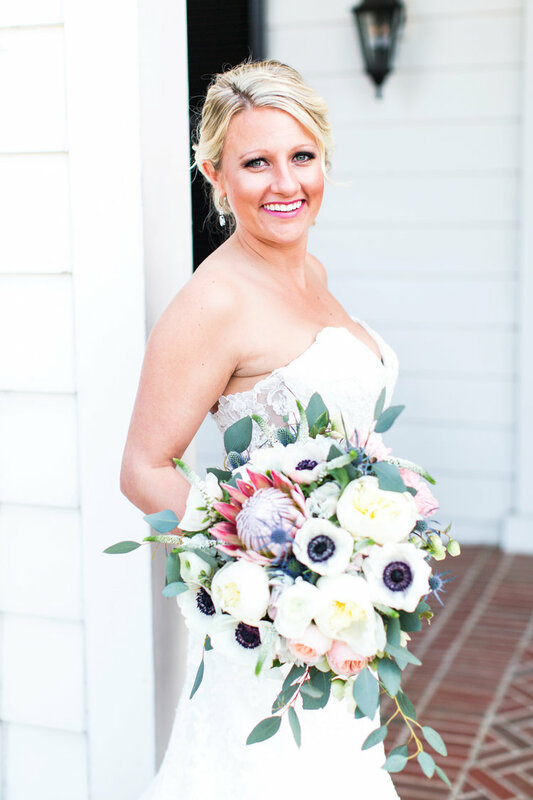 When looking for a venue they struggled at first but quickly found her dream location - A southern, graceful country club in the heart of the Grand Strand and one of Myrtle Beach’s oldest landmarks, Pine Lakes Country Club. Delicate anemones were flown in from Italy and became the centerfold to the bouquets & arrangement. This wedding had all the bells & whistles including moscow mules, airbrush hats and a geo shaped cake with marbling fondant and gold foiling. Hannah & Greg went out with a BANG! with a surprise firework exit! "Santana is phenomenal! She & Heather made our wedding day everything we dreamed of and more! I had the most stress free and relaxing wedding day and it's all because of the hard work that was put in by these awesome ladies! We couldn't have asked for a better event coordinator!" "Santana is the Queen of fixing emergencies! When i needed a new dress two weeks before the wedding, she not only helped me pick one, she found me an amazing seamstress to complete the alterations in 5 days! On the day of the wedding, when my priest got on a bus to the wrong wedding, she altered the timeline and coordinated with the other vendors so seamlessly that my guests seriously thought it was a 'Southern thing' to have the cocktail hour before the ceremony! She has great design ideas, creative budgeting tools lol, and continues to help you with questions weeks after the wedding! Not only a true professional, but has become a great friend too! Cheers, girlfriend!" "Toby and myself (Amanda) were fortunate enough to meet Santana before she went out on her own... she has gone above and beyond to help us plan for our destination wedding... which will be happening in September... the vendors that she connected us to are amazing... We are truly blessed to have such an amazing...detail oriented ..fun wedding Coordinator in our corner... I would recommend her to anyone planning a destination wedding in Myrtle Beach or any other event!! Congratulations Santana... we love you! Good luck to you and you future endeavors!!" "Santana was amazing! She took all the stress from me on my wedding day and gave me the confidence that she would take care of everything. She made sure everyone was organized, on time, and dealt with any issues. When I saw everything for the first time it was exactly how I had been imagining it! Santana was extremely professional and made us feel so comfortable with her. She honestly went above and beyond our expectations. I would highly recommend her for any event"
Thank you for visiting! I can't wait to meet you!